The humorous thing about this photo was, during my walk on Sunday with my wife and kids, we were sitting on a bench along the walking path taking a quick break from walking. The distant sounds of a locomotive was approaching, interrupting the peace and quietness of our nature walk. The roar of the engine sped past our view and right there from the very park bench I was sitting on gave me this great reflective view of the passing train. How often do you not have to move from your location to get a bonus photo for your blog? How cool is that? Neat shot, sorry about the Wild. Thanks for that link, its right up my alley. Very cool! I bet the kids enjoyed that! Much of photography is placing yourself in the right place to be there at the right time. Serendipity I believe. 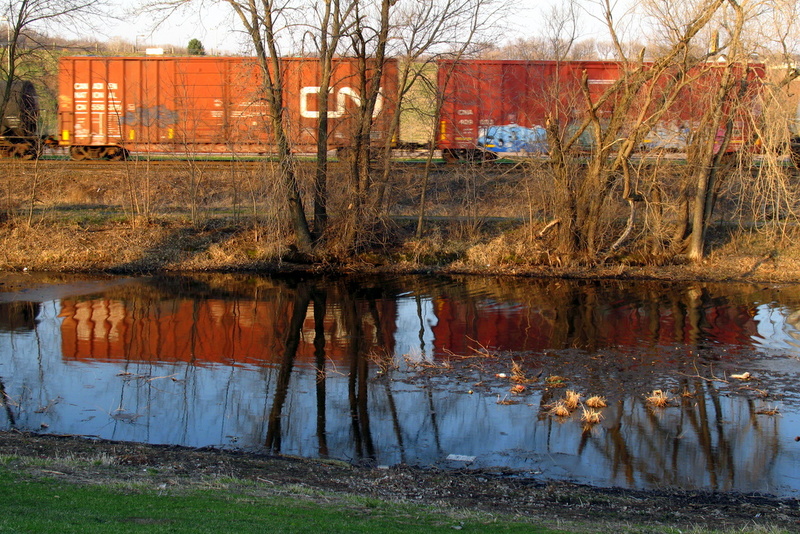 The trick is to be there -:) The train doesn't seem to bother the ducks much. Nice reflection and warm afternoon light. Amazing how we find these little gem's when we stop looking for them and realise they are right where we are. Well done, this is an excellent pic.